Reminders of Abu Ghraib in Lucy Crowe’s prison uniform. A wicked minotaur, banned from Dejanira comes back to wreck his havoc. Hercules, Handel's musical drama, which has in the past decade been transformed to full opera by Luc Bondy and now directed by Peter Sellars at the Lyric, is a gorgeous piece of music with themes of unsual power and aptness for our times. Some have encouraged the President to attend a performance at his local opera house in Chicago, and he would surely have a thrilling evening. Of all of the problems confronting our country now, and Sellars certainly sees us in the bleakest of frames, returning war veterans who are unable to adjust to the domestic lives they left behind are of particularly compassionate concern to both President Obama and his wife Michelle. In the Sellars' take on the opera, Dejanira, sung by the magnificent British mezzo soprano Alice Coote, is at home waiting for the return of her husband, Hercules, who has stayed away for an unusually long time. The first news from an oracle is that Hercules has died. But then a mesenger arrives to confirm that he in fact lives and is on his way home, triumphant. The text which refers to constellations in their spinning paths is visually translated into a backdrop of stars and comets. These change with the changing mood of the piece:the shadow and light of joy and pain, loss and recovery, despair and hope. The chorus spins with the good news about Hercules, but Dejanira's melancholy returns with a characteristic Greek anxiey over the cost of her husband's victories and particularly his victims. In the Lyric production, these victiims are embodied in Iola, a slave who Hercules has brought home with him to both torture and enjoy sexually. 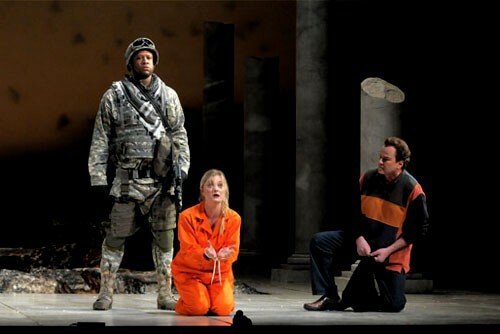 Wearing orange prisoner's garb we associatie with Abu Ghraib, and with her face covered by a black hood, Iole sings her first aria, one of Handel's most emotionally draining. She sings of the murder of her father by Hercules and of the crimson blood. Even though she is masked, we know a star is born. Lucy Crowe's cool, bright, delightful sound rang though the house all evening, and she entranced. That she got all her de capos meant that the production was weighted in her favor, but hers is a voice it would be difficult to resist displaying. Broken columns circle the stage, rising above shards of rock and boulders, which change color with the sky. The costumes are contemporary. Soldiers wear the familiar US Army uniform. Peter Sellars, the preeminent American opera director, brilliantly takes art created in another time and makes it live in ours. His method most often is to transfer the action to our times. In this Hercules, when the stars in the sky turn red, we have, for what seemed liked at least five minutes, bright red light spotlighted on us the audience. We are complicitous, but still perhaps capable of being effectively engaged in the actions and passions of our times. That this is done with singers of such hgih calibre does help us, if not to understand, to at least feel the issues viscerally. Richard Croft, suffering from a cold announced pre-performance, but soldiering on, is a superb Handelian tenor. As Hyllus, his romantic attachment to Iole is touchingly heightened in the Sellars interpretation. Eric Owens, who we have so often praised in Ligeti, Wagner, John Adams and Mendelssohn's Elijah, is a muscular and often terrifying Hercules. Although he has not yet mastered the baroque style, which given his track record he surely will sooner rather than later, he cuts a mighty warrior. He will be in Tanglewood for Beethoven's Ninth this summer. David Daniels, the counter tenor who sings Lichas, often comforts Dejanira and serves also as family counsellor. The beauty of his voice has understandably focused interest on this fach again. The depth of talent in the Lyric production is remarkable, even by the company's high standards. Harry Bicket, a baroque specialist, conducted a sprightly orchestra. The chorus, always special at the Lyric, performed a large role with great aplomb. During one part, men and women sang as couples, (and a man with a man, and a man alone). This mixed the voices in a texture to which we're not accostumed, and its effect was not only unusual, but lovely. Assigned hand gestures did not work as well, however. Joyce Di Donato singing Dejanira in Luc Bondy's Hercules, goes mad and kills herself. Sellars, in a pre-concert lecture, explained that he needed a more hopeful ending, one inspired by the Enlightenment and even Thomas Jefferson. I have the sad sense that an awful suicide is still the way to get most people to sit up and attend our homecoming heros. Policy on purple hearts has recently changed to include men and women who have been brain damaged in war. Sellars makes you think about these important issues in the context of some of the most beautiful music ever written. 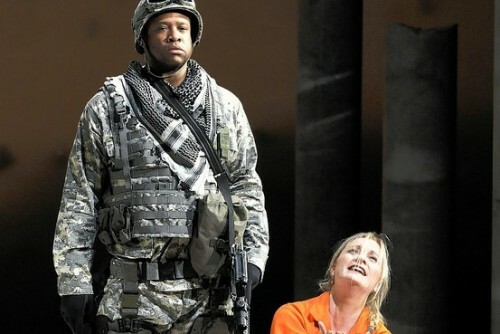 At the Lyric Opera through March 21. Ticket information at lyricopera.org.